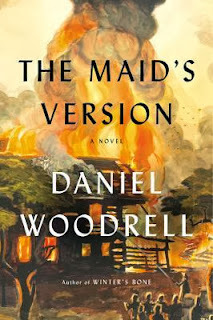 Shelf Inflicted: Another Great Novel from the Author of "Winter's Bone"
Another Great Novel from the Author of "Winter's Bone"
This is another excellent book from Daniel Woodrell, who returns with his first novel since Winter's Bone in 2006. In 1928, the tiny town of West Table, Missouri, was shattered by the explosion of the Arbor Dance Hall. Forty-two of the town's residents were killed in the explosion and in the fire that followed; dozens of others were injured. But although many explanations for the tragedy were put forward, the guilty party or parties were never identified and prosecuted. Some townspeople blamed local gypsies; others thought that St. Louis mobsters were responsible. Some wondered if the explosion was the work of the local minister who preached hell and damnation and who railed against the "sinners" who patronized the dance hall. Alma Dunahew is the mother of three boys and works as a domestic in the house of the town's leading banker. Alma's sister, Ruby, is a carefree young woman who uses and disposes of men as the spirit moves her, until the night she too becomes a victim of the dance hall tragedy. Alma has her own idea about what happened that night, and as the incident overwhelms her emotionally, she gradually loses touch with reality. She alienates members of her own family and many of the townspeople; she loses her job and has to cobble together a living as best she can. Years later, in 1965, her grandson Alek is sent to spend the summer with her and over the course of the summer, Alma slowly tells him the story of the events that led to the explosion of the dance hall. It's a riveting tale, told mostly in flashbacks and it grabs the reader from the opening line. "She frightened me at every dawn the summer I stayed with her," young Alek later recalls. The reader can only be enormously impressed by the skill with which Daniel Woodrell tells Alma's story.